Power generated through renewable energy sources has expanded at a rapid rate over the last decade and continues to grow globally. What have been the reasons behind this spurt in activity? 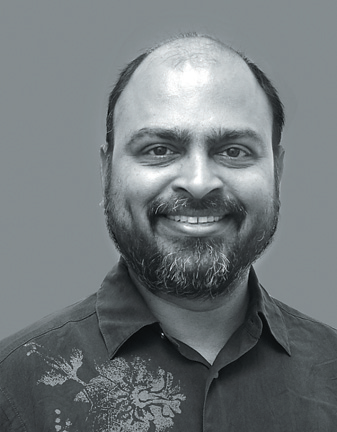 Professors Ashwini Chhatre and Brian Dill provide a historical overview and describe the dynamic set of global drivers that propel the expansion of renewable energy within the global discourse on sustainability. Electricity from renewable sources has become a dominant feature of contemporary debates on sustainability. Over the past decade, wind, solar, hydro, and geothermal power have experienced sustained growth, amidst greater recognition of their multiple benefits amongst international organizations, national leaders, and common citizens. Global installed capacity for power generation from renewable sources (excluding nuclear energy) at the end of 2010, for example, was around 1200 GigaWatts (GW), up from 700GW just ten years ago (Figure 1). The rate of growth in generating capacity from renewables is now nearly twice that from non-renewable sources (Figure 2). Although renewable power has not expanded evenly across the globe, the overall rate of growth and direction of change is clear (REN21). The rapid expansion of renewable power is most easily explained as arising from the increase in financial flows into the sector. To put this in context, investment in renewable power increased by a factor of six from 2004-2010 (Figure 3). However, financial investment is only the tip of the iceberg; an array of factors and processes are in play across multiple scales that need to be taken into account in order to understand the dynamics of renewable power expansion in the last two decades. We have every reason to expect that the current trend will continue unabated for years to come. And yet there is no single explicit catalyst of renewable power’s recent expansion. There is, for example, no comprehensive regulatory regime directing efforts to increase the supply of electricity that is derived from renewable sources. There is no single global discourse orienting public, civic, and private actors toward renewables. Nor is there a singular global institution that incentivises countries to undertake an energy transition. 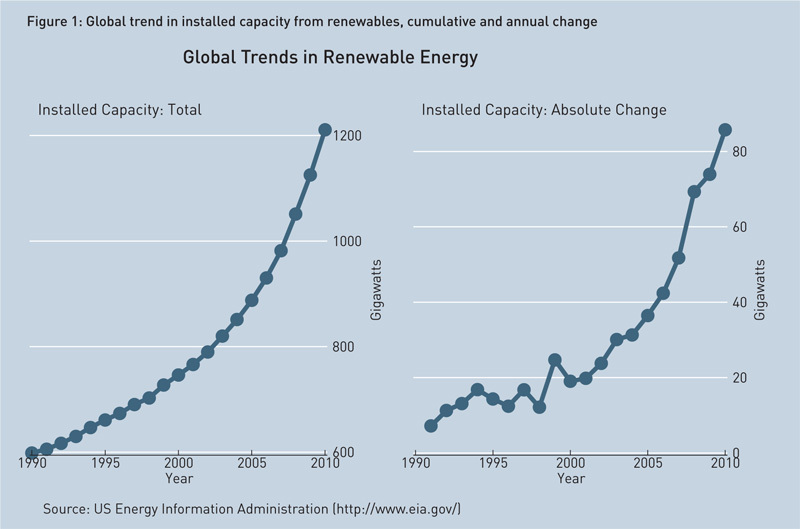 How, then, can we account for the rapid expansion of renewables? Why has the renewable power sector grown so rapidly? In this article, we outline a set of global drivers that propel the expansion of renewable power, in interaction with regional, national, and local processes. However, these drivers are not about renewable energy at all. Instead, they form an interconnected web that is best understood as a global regime complex for renewable energy. By regime complex, we refer to loosely coupled sets of discourses and institutions that are not specifically designed for a singular objective (Keohane and Victor 2010). The obvious contrast here is to a global regime, such as the one governing ozone depleting substances, which focuses solely on protecting stratospheric ozone. The regime complex that has impelled the growth of renewable energy consists primarily of three sets of mutually reinforcing global discourses and institutions that incentivise actions and shape behaviour of actors interested and invested in renewable energy: international development, climate change, and market liberalisation. These three drivers are neither explicitly about renewables nor are they functioning in isolation. Rather, they are working together as a regime complex that is transforming the global energy landscape. By discourse, we denote a coherent body of text that has evolved to signify and communicate specific ideas, data, information, and knowledge. This body of text spans all media and serves as the foundation for, as well as the limits to, debate and disagreement on specific questions. A discourse must involve multiple social entities in dialogue that need not be located within a delineated territory, and it can be expanded to any human scale. Discourses can also be embedded within other discourses, allowing for a meta-language for representation. For example, the discourse on communalism in India is restricted to the national scale, and it is often embedded within the discourse on national identity. A global discourse privileges outcomes at the global level and takes the global scale as the starting point for debate on ideas or questions. In this sense, there is a global discourse on renewable energy, and it has evolved over the last five decades into a coherent body of knowledge encompassing socio-economic, technological, and institutional aspects. At the same time, it is primarily embedded within the global discourse on sustainability. However, at the national scale, the discourse on renewable energy also often draws from the discourse on national sovereignty and energy independence. Institutions are coherent and structured sets of rules that shape the behaviour of specific actors in order to produce desired social outcomes. Institutions typically vary dramatically in their mechanisms for rule enforcement, spanning the spectrum from strong social norms and shaming on the one hand to formal penal codes and incarceration on the other. Like discourses, institutions could also target the behaviour of social entities at any scale. Under the existing international system, a global institution is one that is created by agreement among a majority of the world’s nation-states. For example, the World Trade Organization is a global institution that regulates the behaviour of countries in terms of trade openness. Unlike the global discourse, there is no global institution covering renewable energy. In practice, institutions are often embedded in one or more discourses, and there exists a complex network of relationships between and among institutions and discourses at multiple scales. Institutions draw their legitimacy from discourses, and in turn, imbue discourses with greater power through positive and negative incentives for specific behaviours. Institutions at regional and lower scales can draw upon global discourses, and vice versa, lending these relationships a dynamic character. For example, the Clean Development Mechanism is an institutional innovation within the U.N. Framework Convention on Climate Change that draws legitimacy from global discourses on climate change, international development, and environmental sustainability. Over the past six decades, international development has sought to bring about fundamental change in the global South. Following the culmination of the Second World War, this evolving set of discourses, institutions, and practices emerged as various colonies achieved their independence and the Cold War began to take shape. In the years that have followed, various development theories and actors have attempted to explain and to improve the socio-economic futures of these now-independent countries of the South. Whereas the initial focus was narrowly concerned with macro-level structures and economic growth, development has grown into a much more capacious concept that includes a variety of practices and development indicators. The regime complex that has impelled the growth of renewable energy consists primarily of three sets of mutually reinforcing global discourses and institutions that incentivise actions and shape behaviour of actors interested and invested in renewable energy: international development, climate change, and market liberalisation. Energy has long played a central, if otherwise latent, role in most conceptualisations of development. Both modernisation theories and subsequent import-substitution models promoted industrialisation as the sine qua non of economic development, a process that was contingent upon access to an adequate and reliable supply of energy. Such access is also implicit in theories that shift the focus away from economic growth. The Human Development paradigm, for example, is ultimately concerned with the expansion of individuals’ choices, capabilities, and freedoms. Its proponents have suggested that a positive relationship exists between improving energy services and enhancing the quality of people’s lives. Today, international development is largely oriented around the Millennium Development Goals (MDGs). The MDGs are eight specific goals with measurable targets that were agreed upon by the leaders of 189 countries in 2000, when they signed the historic millennium declaration at the United Nations Millennium Summit. These eight goals are set to expire in 2015. Although improving access to energy services is not a stated goal, and energy is never explicitly mentioned in any of the MDGs, development scholars and practitioners have argued that extending the use of modern cooking fuels and access to electricity is indispensable to the accomplishment of each goal. Given the pending expiration of the MDGs, the international community has sought to determine what comes next. This subject of multiple, ongoing global conversations received some early direction from the United Nations High-Level Panel (HLP) for the Post-2015 Development Agenda, when it made some suggestions in 2013. Many of the twelve goals that the HLP seeks to advance have long occupied a central place in most conceptions of development. Efforts to address poverty, improve health care, and increase access to education have, for example, been the core of the Human Development paradigm for nearly two decades. The HLP has gone further, however, with its inclusion of several new goals, including the goal of securing sustainable energy, and in particular its argument that sustainable development must be at the core of all future development efforts. Although the post-2015 development goals have yet to be agreed upon, they have already been named: the Millennium Development Goals will be replaced by the Sustainable Development Goals. Sustainability has indeed become the guiding principle for all contemporary debates about development. Concern for climate change (see below), environmental degradation, and their anticipated deleterious social impacts has impelled the global community to attempt to integrate and advance the social, economic, and environmental dimensions of sustainability in meaningful ways. The most recent iteration of this effort is the United Nations Sustainable Energy for All initiative (United Nations 2012). In addition to ensuring universal access to modern energy services and doubling the rate of improvement in energy efficiency, this initiative seeks to double the share of renewable energy in the global energy mix. Various development institutions, including the World Bank and its regional counterparts, bilateral development agencies, and international nongovernmental organizations, have begun to put this discourse into action. 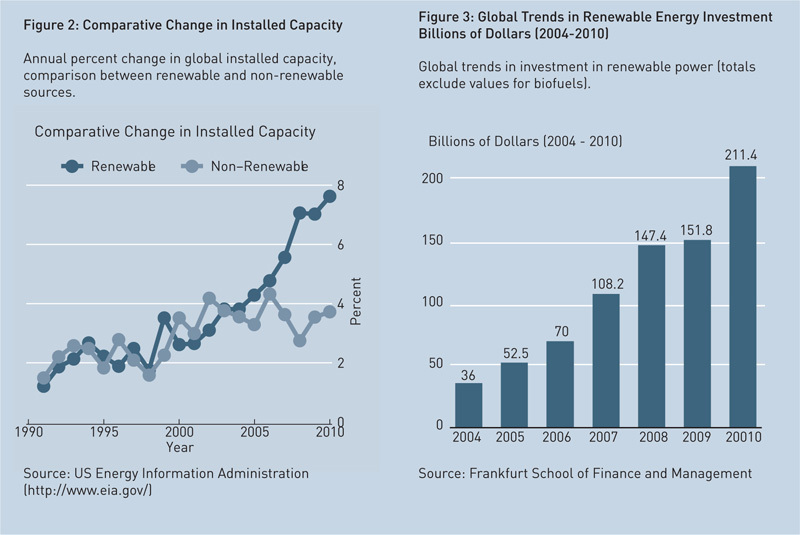 One illustration of development institutions’ increasing commitment to renewable energy can be observed in Figure 4. 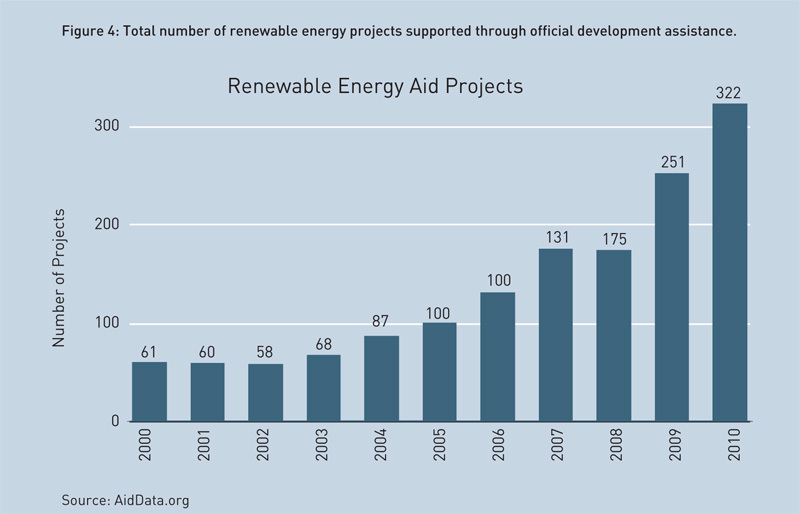 It shows that the number of renewable energy aid projects has increased by more than a factor of five in a single decade (2000-2010). The discourse and institutions concerned with anthropogenic climate change are of more recent vintage than those dealing with international development. They represent the culmination of global conversations about the relationship between the environment and development that have occurred over the past four decades and a more recent and significant body of scientific evidence that links a changing climate with the rise of CO2 emissions. The U.N. Conference on the Human Environment (UNCHE), which was convened in Stockholm in 1972, was a watershed moment in environmental protection. It not only elevated the environment as an object and issue of global concern but also catalysed many subsequent global conferences on related issues. Among the latter, arguably the most noteworthy was the U.N. Conference on Environment and Development (UNCED) in Rio de Janeiro (popularly known as the Earth Summit) held in 1992. Of the various pressing issues at hand in Rio, the global climate received international recognition and support with representatives from a majority of the world’s countries signing the U.N. Framework Convention on Climate Change (UNFCCC). This convention provided the institutional basis for global action on climate change in alignment with the growing scientific confirmation of the gravity of anthropogenic climate change contained in the first report of the Intergovernmental Panel on Climate Change (IPCC1990). Action was spurred by the dire predictions outlined in the second IPCC report released in 1995, leading to a global agreement to reduce global emissions in 1997. This agreement was known as the Kyoto Protocol because it was signed at the conference held in the Japanese city of that name. Industrialised countries committed in the Kyoto Protocol to reducing their carbon emissions by 2012 without requiring similar reductions of those located in the global South. The Kyoto Protocol also contained an important provision that was to prove catalytic in the expansion of renewable energy five years later. Article 12 of the Protocol set up the Clean Development Mechanism (CDM), whereby developed nations could satisfy their emissions reductions commitments by investing in sustainable projects in the developing world. This was to be done primarily through the accrual of certified emission reduction credits from such projects, which could also be traded between parties. Unfortunately, the Kyoto Protocol has had a troubled history; it was not ratified by the requisite number of parties until 2004 and therefore did not come into force as a global institution until 2005. CDM also suffered accordingly, with initial excitement tapering off over the years. However, by 2003, a CDM Office had been set at the UNFCCC secretariat and began accepting project proposals. Subsequently, CDM has produced the world’s largest carbon market to date; it has also catalyzed the growth of renewable energy. Although projects are not limited to renewable energy to qualify for CDM credits, Figure 5 shows that new renewable energy projects under CDM have grown steadily every year since its inception, and surpassed non-renewable projects in 2009. 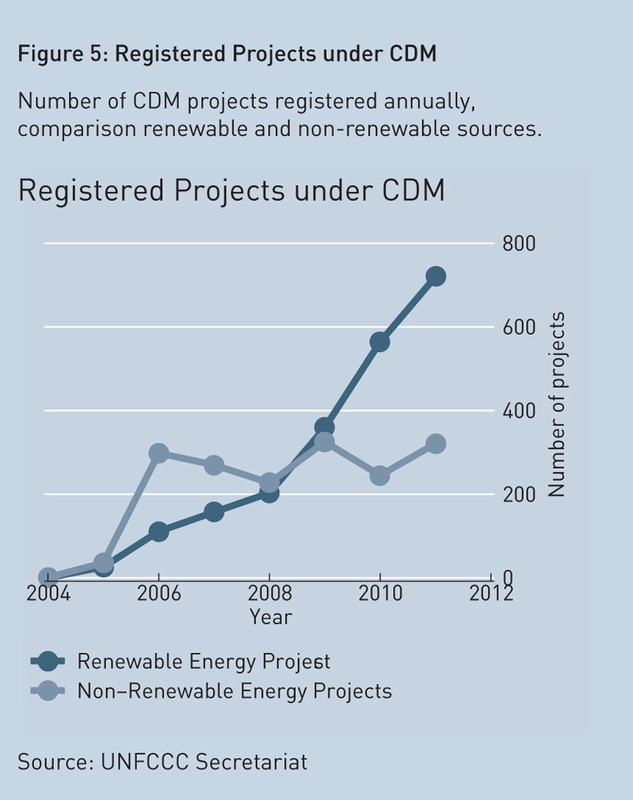 By 2012, renewable energy projects represented two-thirds of new projects registered under CDM. Over less than a decade, CDM has resulted in the establishment of 2145 renewable energy projects with a total installed capacity of 84.5 GW in 47 developing countries across Africa, Asia, and Latin America. The future of CDM as a global institutional mechanism is somewhat uncertain. The first commitment period for the Kyoto Protocol ended in 2012; the second commitment period (2012-2020) has been agreed but not ratified by the requisite number of countries. However, CDM will continue to play an important role. Continuing negotiations under the UNFCCC have led to agreement on creating an Adaptation Fund managed by the World Bank, which will be supported through a 2% levy on the sale of certified emission reduction (CER) credits under CDM (UNFCCC). As of March 31, 2014, the Fund had accrued US$ 189.8 million in proceeds from CER sales, though only about a third of these have come from renewable energy projects (AF Financial Report, 2013). In addition to its importance in global efforts to reduce carbon emissions, renewable energy continues to gain prominence in climate change discourse. The last three IPCC reports have increasingly highlighted the important role that renewable energy can play in reconciling the urgent need to reduce carbon emissions with the growing demand for energy in developing countries. In tandem with shifts in the discourse on international development and climate change, the global discourse on market liberalisation has gained prominence over the last three decades. This discourse is embedded within the global discourse on free trade and is focused on reducing and removing tariff and non-tariff barriers to international trade. This discourse can be traced back to at least the 17th century. Global institutions such as the World Bank and International Monetary Fund operationalized the discourse after the Second World War. However, it was not until the 1980s that the discourse gained traction at the global level. By the early 1990s, removing barriers to international trade was generally accepted as an important strategy for accelerated economic growth. Efforts to create a unified global institution to facilitate the reduction of trade barriers bore fruit soon after the 1992 Earth Summit in Rio, and the World Trade Organization was born in 1995. The discourse on market liberalisation in general and the WTO in particular have influenced the growth of renewable energy in two ways. One, the reduction in import duties on equipment and components required for renewable power made it more economically competitive with power from non-renewable sources. This trend was also accompanied and assisted by tremendous advances in renewable energy technologies, particularly wind turbines and solar photo-voltaic systems. Two, liberalisation of capital markets allowed private actors to invest in renewable energy projects in new countries, especially focusing on the newly industrialising economies. Although liberalisation of energy markets has not progressed as much as trade in goods and services, the flows of international capital have contributed significantly to the expansion of renewable power. While foreign direct investment doubled between 2004 and 2010, global foreign direct investment in renewable energy projects increased six times during the same period (Figure 3). With increasing liberalisation of energy markets within countries, many private equity funds have begun to invest in diversifying their portfolios by investing in renewable energy. International trends in portfolio equity investment have lagged behind foreign direct investment globally, as countries have been slow to allow foreign ownership of controlling stakes in companies operating on their territories. However, this pace has picked up after the global recession, with portfolio equity increasing in tandem with foreign direct investment. It is unclear how much of this trend is true for investment in renewable energy projects, but there is no reason to believe increase in portfolio equity investment does not match the growth in foreign direct investment for renewable energy. Unlike international development and climate change, market liberalisation is not perceived as having natural synergies with renewable energy. In fact, several recent disputes at the WTO have focused on whether protections afforded to domestic producers of renewable energy and its equipment amount to market distortions that are illegal under WTO. This is in stark contrast to climate change, where renewable energy is considered an important plank in efforts to reduce carbon emissions, and in international development, where renewable energy is seen as reconciling the contradictions between poverty alleviation and environmental degradation. In spite of this lack of perceived natural synergies, the global discourse on market liberalisation and the impact of the WTO in reducing barriers to trade and investment across borders has contributed significantly to the observed growth in renewable power across the world. While the growth in renewable energy is impressive, it is equally important to consider its uneven geography. In 2008 for the first time, more renewable energy than conventional power capacity was added in both the European Union and United States, demonstrating a “fundamental transition” of the world’s energy markets towards renewables, according to a report released by REN21, a global renewable energy policy network based in Paris. In 2010, renewable power comprised about a third of the newly built power generation capacities (based on authors’ calculations derived from US Energy Information Administration data), but the majority of this addition was concentrated in OECD countries and selected others, especially in China, India, Brazil, Indonesia, and South Africa. In a sign of increasing global integration stratified by income, the signature of growth in renewable energy is not concentration in a particular region but in a class of middle income countries. While Europe stands out as the region with growth in renewable energy spread relatively equally, it has been outpaced by Asia in terms of added capacity. 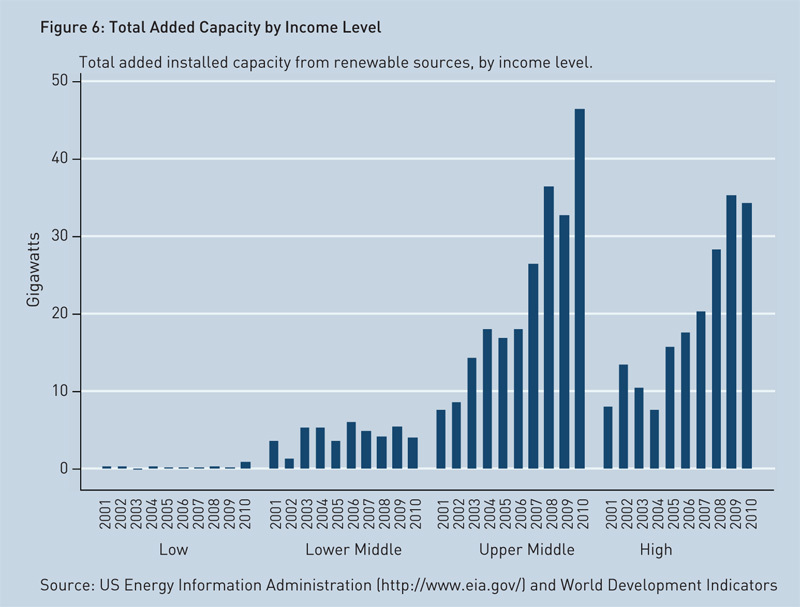 Taking World Bank categories for dividing countries into income groups, the upper-middle income countries have shown the strongest trend in incremental and cumulative installed capacity for renewable power (Figure 6). Low income countries have largely been observers rather than participants in this global expansion, raising question marks on the ability of renewable energy to meet sustainable development goals. This exclusion does have a geographic concentration – the countries are mostly concentrated in Sub-Saharan Africa. Recent debates on poverty alleviation in Africa have included a more focused analysis of renewable energy potential, and factors impeding its development. The new United Nations Sustainable Energy for All initiative emphasises the need to develop mechanisms for energy delivery to people located far from the power grid. Recent developments in combining development finance and emissions reduction have also concentrated on reaching out to low income countries. One such example is the SREP (Scaling Up Renewable Energy in Low Income Countries Program), a targeted program of the Strategic Climate Fund (SCF), which is one of two funds within the framework of the Climate Investment Funds (CIF). SREP has committed to invest $551 million in eight low-income countries over the next five years, with the explicit objective of using renewable energy to demonstrate low-carbon development pathways (CIF). The emergence of a global regime complex driving the expansion of renewable power has so far received almost no attention, in spite of the stated desire of a wide spectrum of actors and analysts for an energy transition. Renewable energy is prized for a variety of non-controversial and complementary reasons – mitigation of climate change, alleviation of energy poverty, national energy independence, environmental sustainability, community-based sustainable development, and a host of others. The actual generation of electricity from renewable sources – the focus of this article – is governed by a host of factors operating at multiple scales. A non-exhaustive list would include local renewable energy potential, status of infrastructure, national and regional policies, and societal values and beliefs. We have highlighted the interconnected set of global discourses and institutions designed around international development, climate change, and market liberalisation, which functions as a regime complex facilitating the expansion of renewable power around the globe. Being a dynamic and complex network, it is difficult to predict the evolution of this regime complex. The trends indicate that renewable energy is becoming more prominent in the intersections of these discourses, leading to its consolidation as an idea and a body of knowledge. At the same time, the institutions associated with these global discourses are helping to accelerate the establishment of renewable power in many countries, and enabling its expansion into new regions of the globe. AF Financial Report (2013), The World Bank Group: Financial Intermediary Funds – Adaptation Fund Trust Fund, Financial Report, September 30, 2013. IPCC (1990), “Climate Change: The IPCC Scientific Assessment”, Eds. Houghton JT, GJ Jenkins and JJ Ephraums, Cambridge, New York, Melbourne: Cambridge University Press. Keohane, R. O. and D. G.Victor (2010). “The Regime Complex for Climate Change” Discussion Paper 2010-33, Cambridge, Mass. : Harvard Project on International Climate Agreements. REN21 (2013). Renewables 2013 Global Status Report. REN 21 Secretariat, Paris. United Nations (2012). Sustainable Energy for All: A Global Action Agenda. United Nations, New York. Senior Research Fellow, Bharti Institute and Visiting Professor, ISB. Brian Dill is Assistant Professor of Sociology at the University of Illinois at Urbana-Champaign.